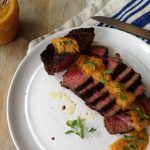 A simple perfectly cooked steak drizzled with a smoky golden roasted pepper sauce. You can opt for red, yellow or green peppers here! Goes well with chicken, fish and pasta as well. About this fat piece of steak: it’s a fat piece of organic grass-fed steak ! Makes sense right ?! Great ! I coated it extra generously in sea salt, freshly cracked black pepper and crushed red pepper flakes and sizzled it on a hot hot hot cast iron grill. But first I made a killer roasted pepper sauce . 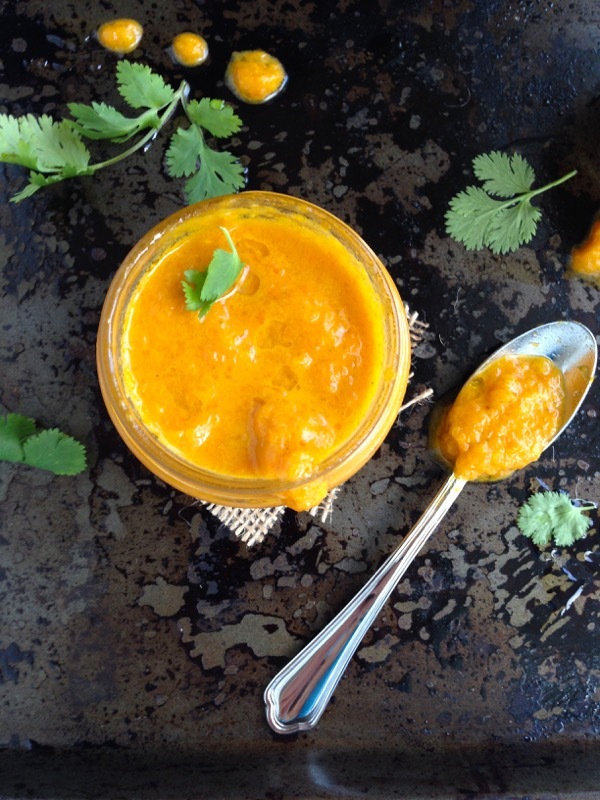 A milder version of the classic Moroccan Red Harissa sauce. 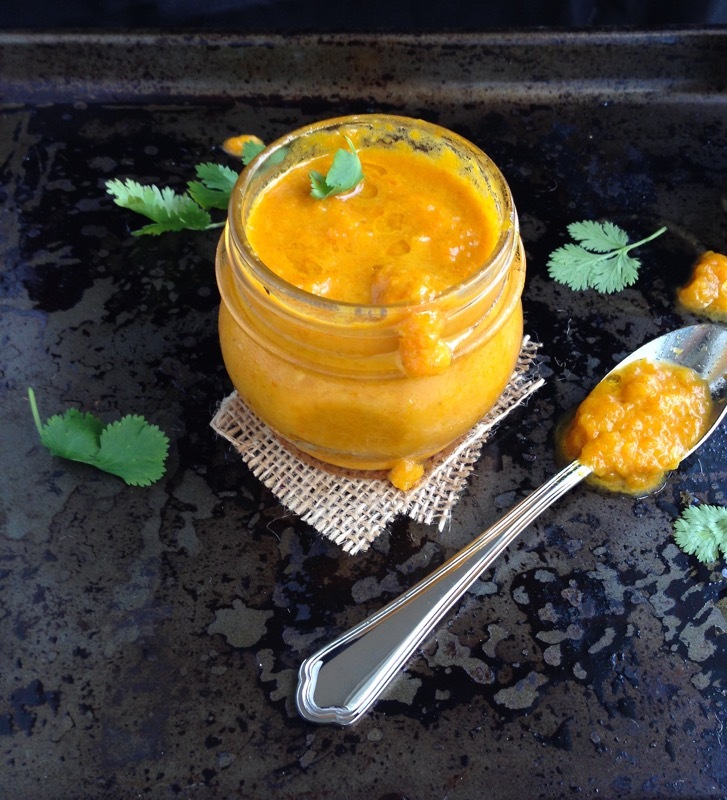 So I roasted a couple of golden bell peppers, for a much needed smooth wave of smokiness going through the sauce. Then I drizzled all over the steak. It works together like peanut butter and jelly. You should see for yourself ! P.S. This healthy potato salad comes to mind as a great side dish for this steak scenario. 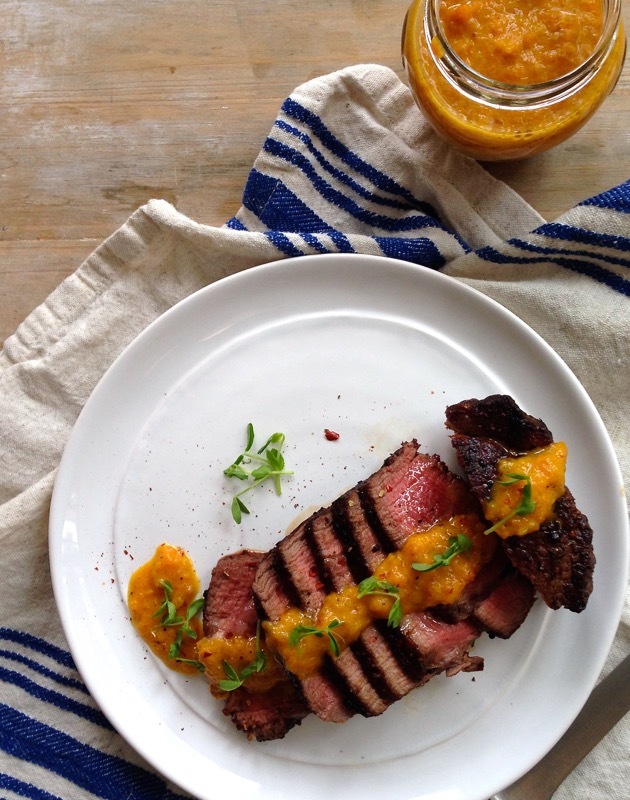 A simple perfectly cooked steak drizzled with a smoky golden roasted pepper sauce. Roast the peppers on a cast iron plate on medium high flame until charred all over. Transfer to a bowl and cover with plastic wrap until cool enough to handle. Peel the skins and discard together with the seeds and core. Keep the seeds and membranes of the chile pepper. Transfer the roasted peppers to the bowl of a small food processor and purée with the olive oil, red wine vinegar, garlic, cumin and sea salt until smooth. Adjust seasonings to your taste. Meanwhile preheat a cast iron grill/plate on medium high flame. Coat the steaks with a little bit of olive oil all over then generously season with sea salt, black pepper and red pepper flakes. Don’t be stingy with the seasonings, season well all over including the sides. Grill the steaks for 3 minutes on each side for medium rare and 1 minute on each of the edges. A total of 10 minutes. Cook an extra 2 minutes for medium doneness. Allow the steaks to rest a few minutes for the juices to redistribute, before slicing them and serving with the golden roasted pepper sauce on top and garnishes with the pea shoots. 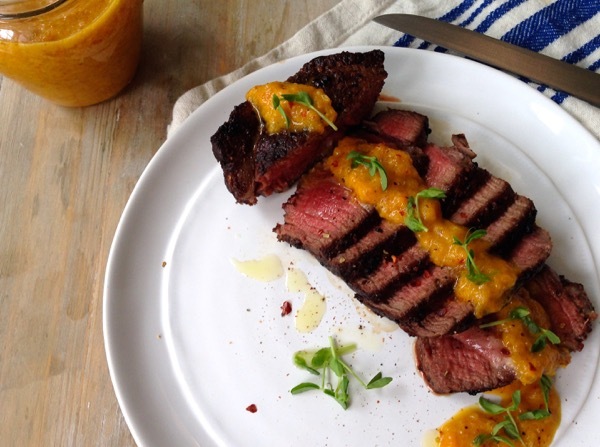 This steak goes great with a smoky Moroccan Red Harissa sauce as well.